Adeline Virginia Woolf was born in London, daughter of the critic and biographer Sir Leslie Stephen (1832–1904). She was educated at home. With her sister Vanessa (1879–1961), who married the art critic Clive Bell in 1907, she was a leading figure in the avant-garde circle which came to be known as the ‘Bloomsbury Group’ because the Stephen sisters’ home was in Bloomsbury. With her husband, the novelist and political theorist Leonard Woolf (1880–1969), she founded the Hogarth Press in 1917. 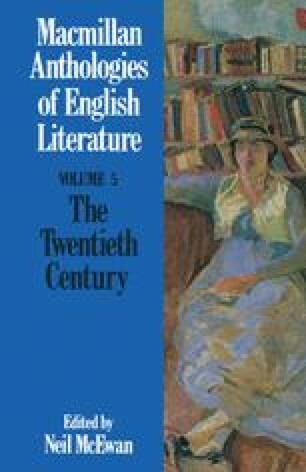 Virginia Woolf’s first two novels, The Voyage Out (1915) and Night and Day (1919) followed usual storytelling conventions, but Jacob’s Room (1922), Mrs Dalloway (1925), To the Lighthouse (1927), Orlando (1928), The Waves (1931) and Between the Acts (1941) are experiments with fictional technique, most impressive in their prose poetry. The two volumes of The Common Reader (1925, 1932) are collections of critical essays. A Room of One’s Own (1929) is a discussion of feminist themes. Virginia Woolf was a brilliant letter-writer and diarist.